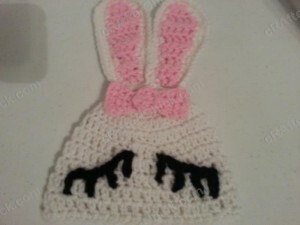 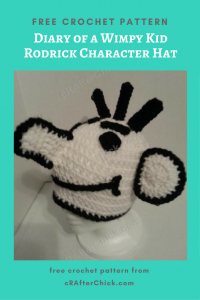 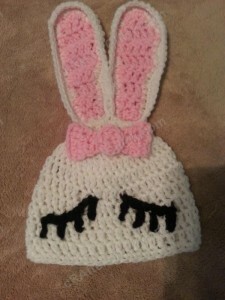 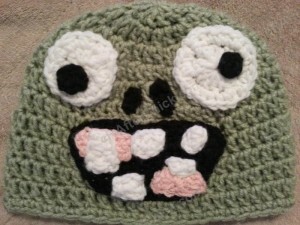 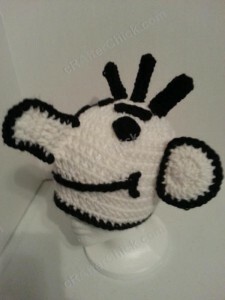 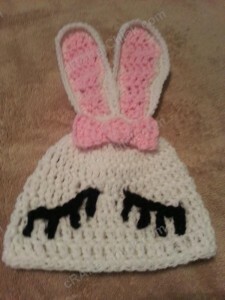 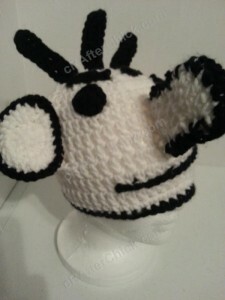 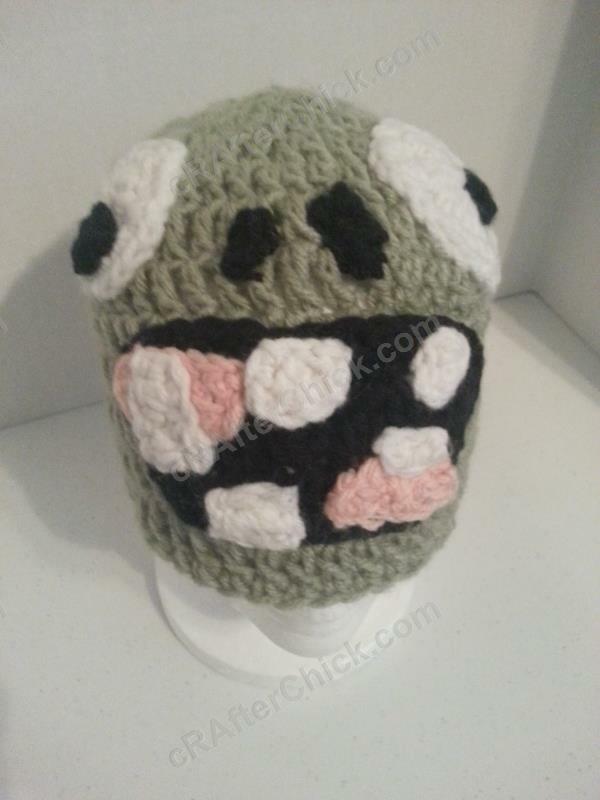 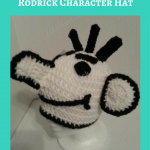 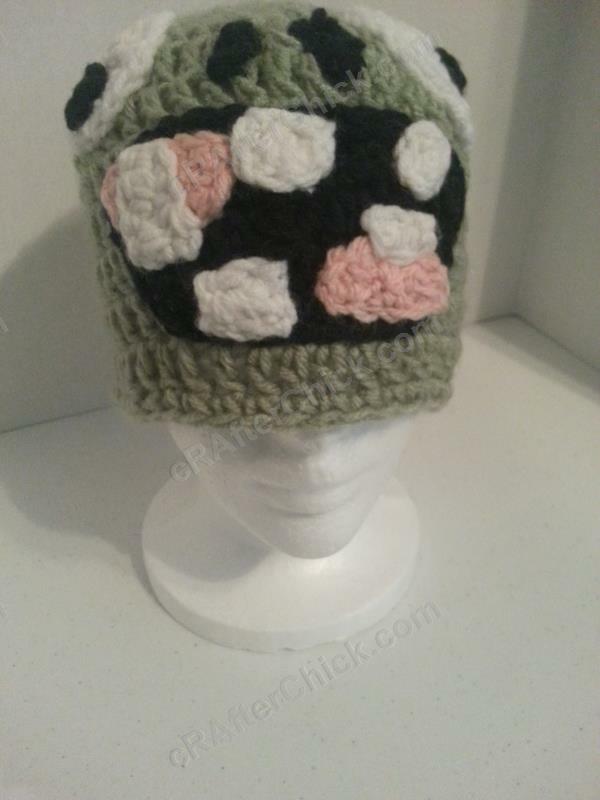 This hat was designed for one of amazing Juvenile Arthritis kids mother, Rochelle, who also has Autoimmune Arthritis. 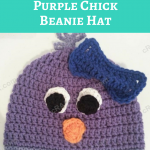 When she heard I was making our walk team Chick hats to wear she was a bit bummed as she is a part of her son’s arthritis walk team Parker’s Purple Playas. So this pretty purple chick designed was created to bring together the RA Chicks chick idea with Parker’s purple. I even topped her off with an arthritis awareness blue bow. Of course you can feel free to switch up the colors to whatever you like but I had to share the instruction for arthritis awareness since I’m a health activist for Autoimmune Arthritis. 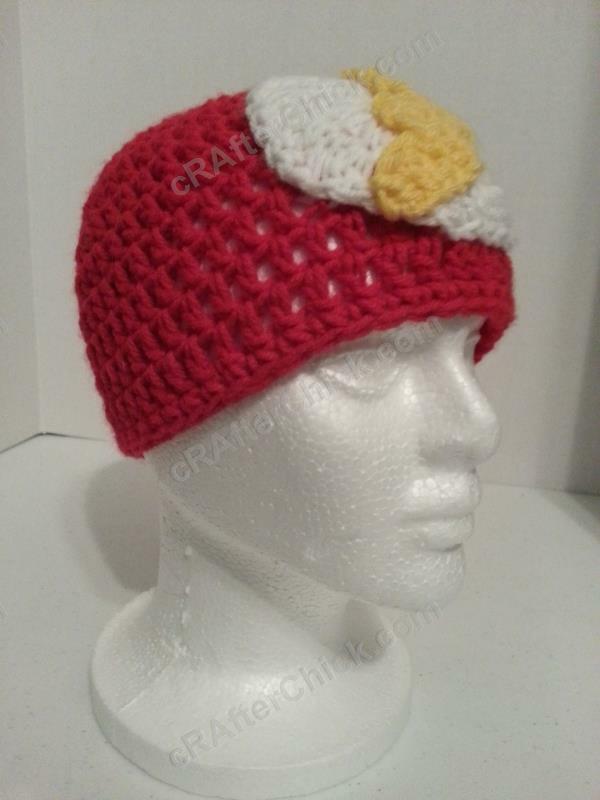 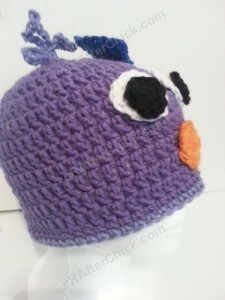 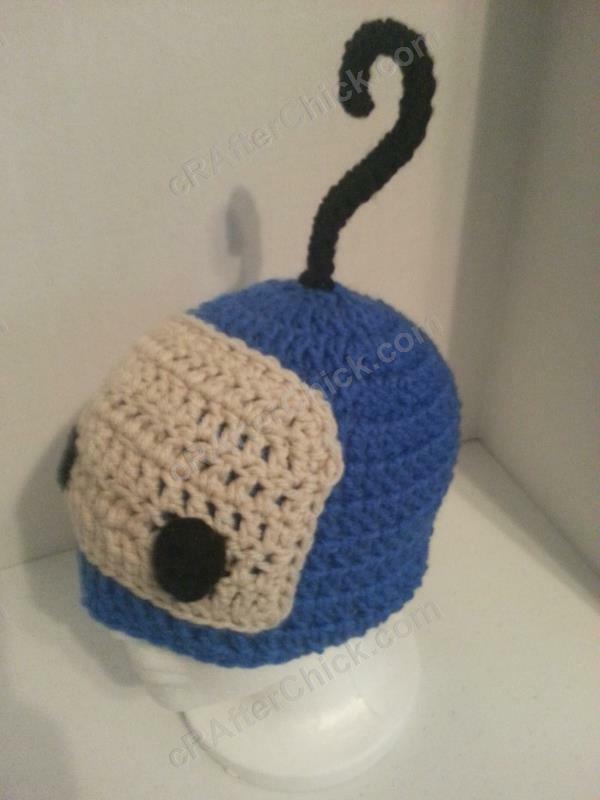 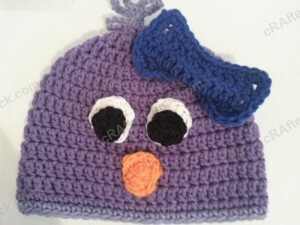 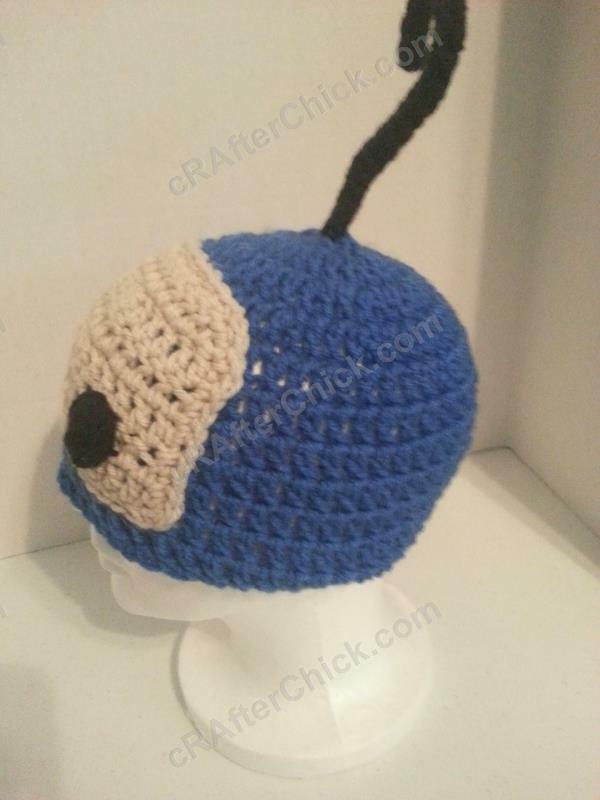 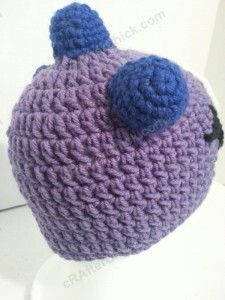 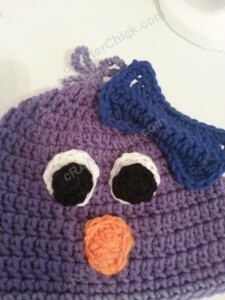 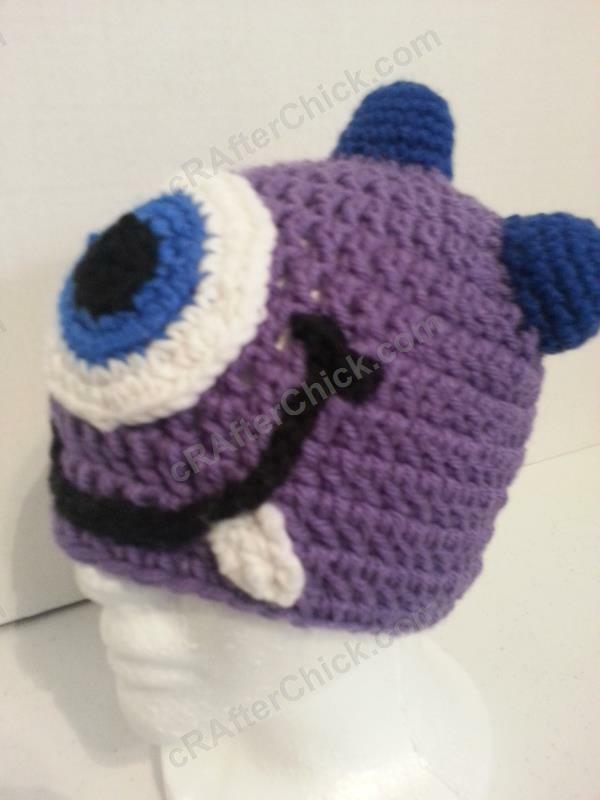 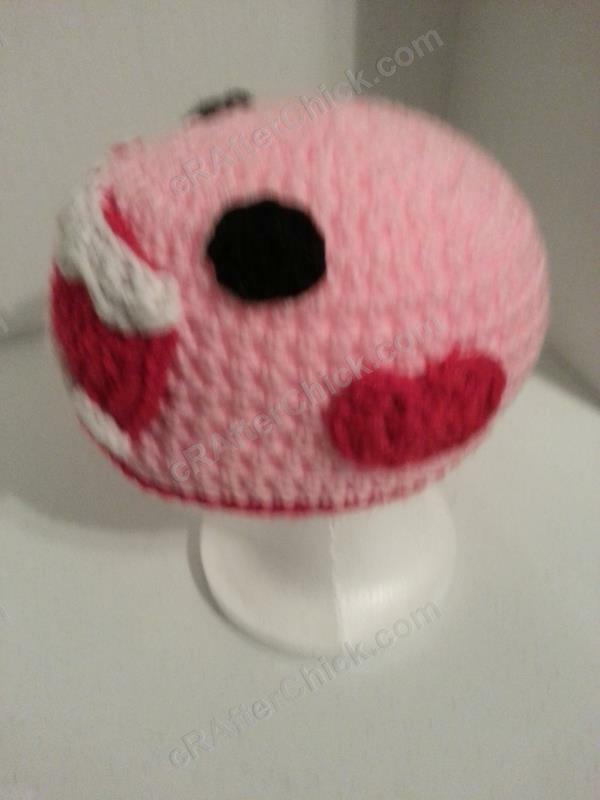 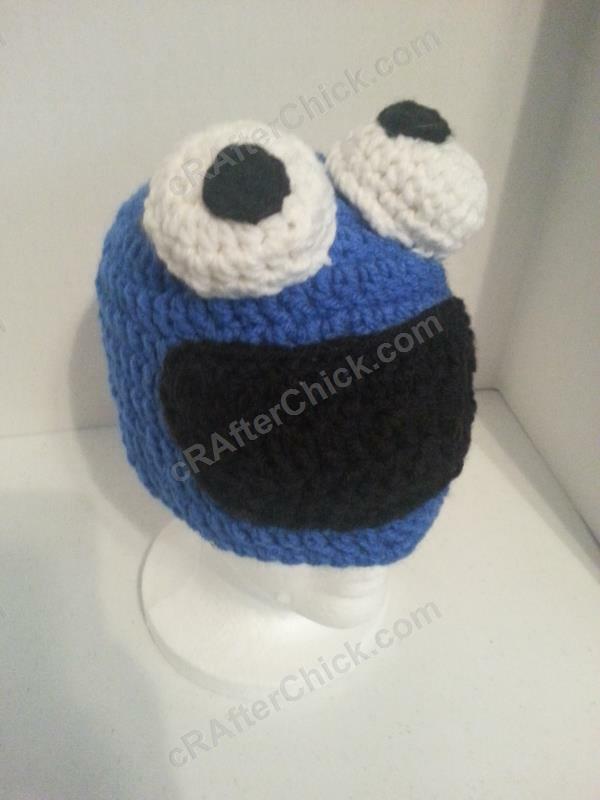 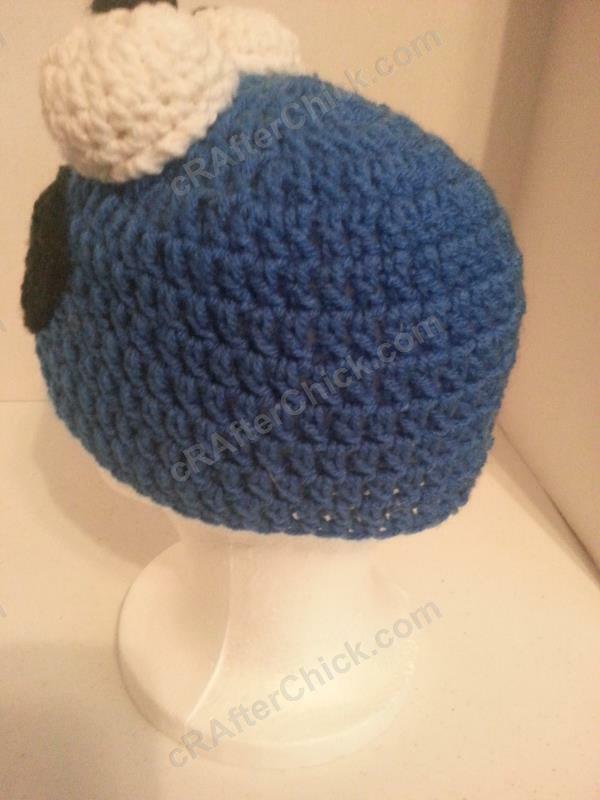 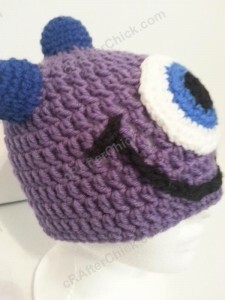 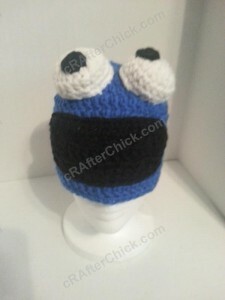 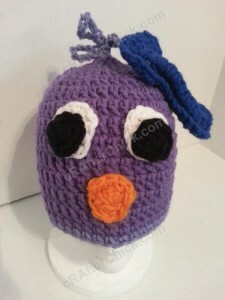 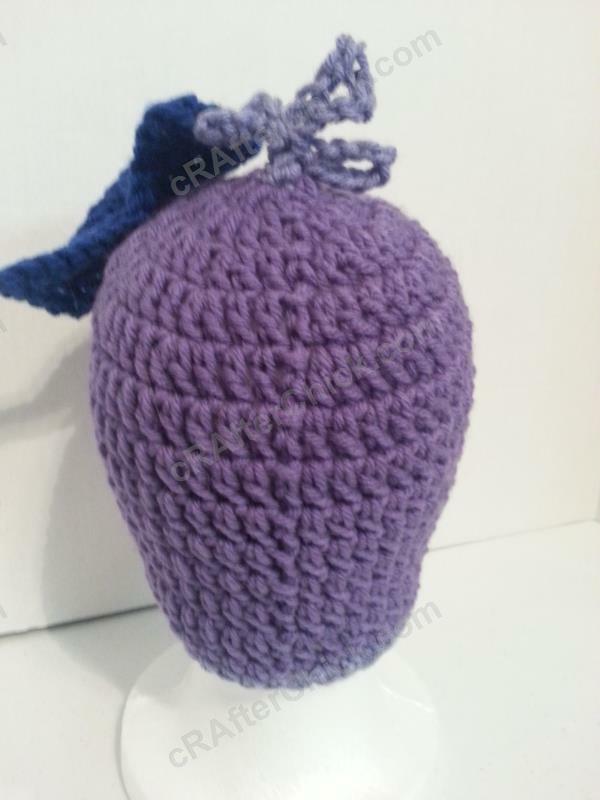 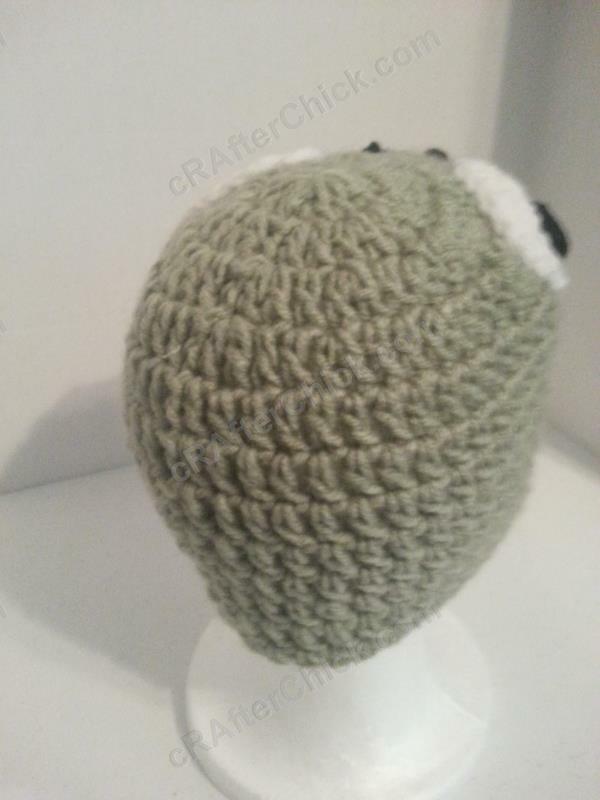 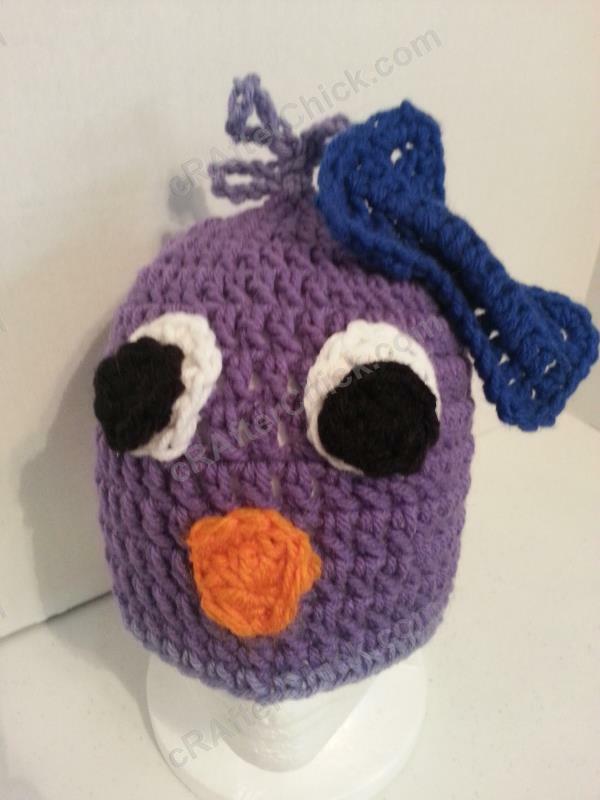 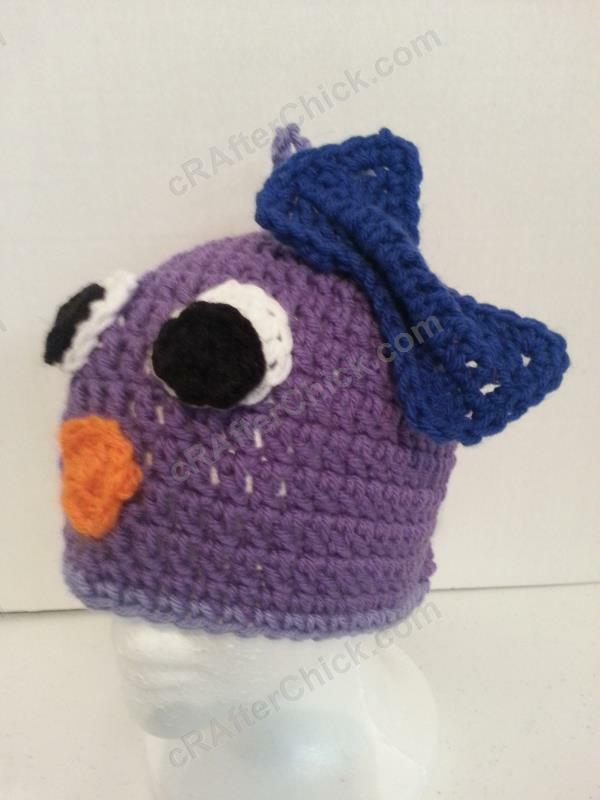 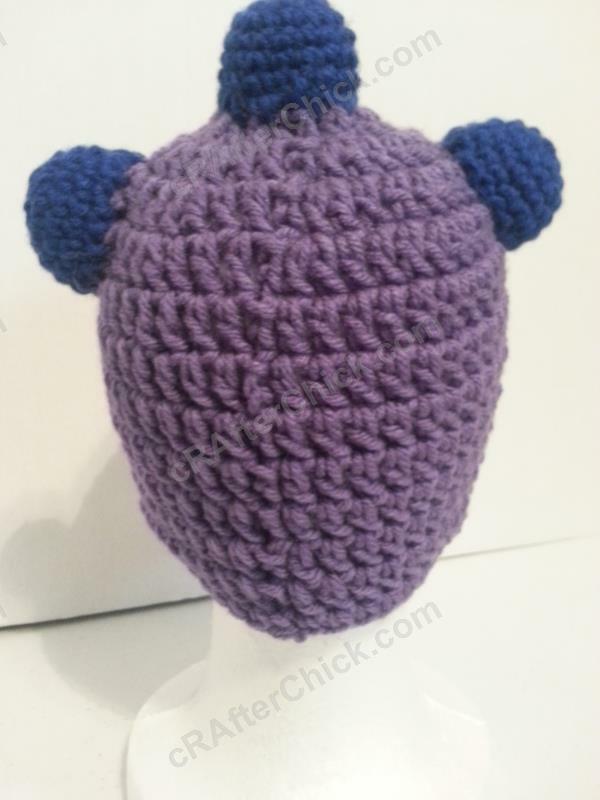 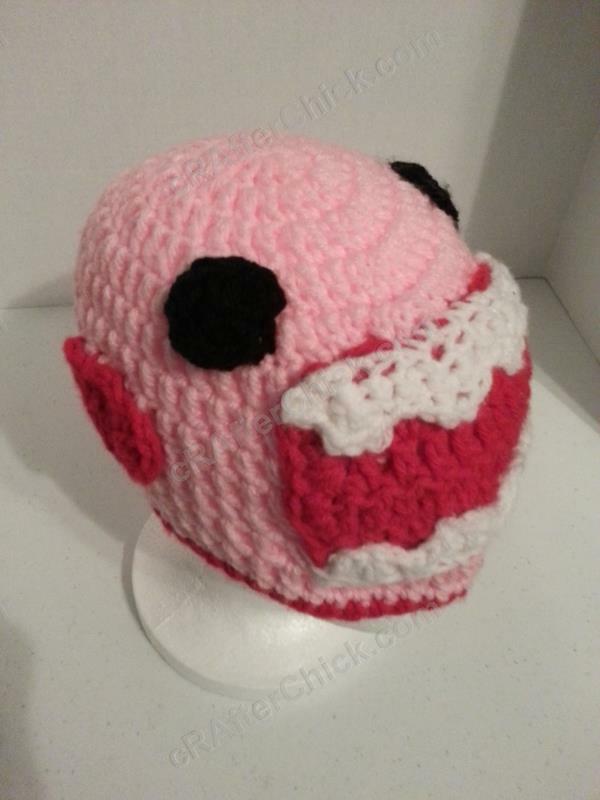 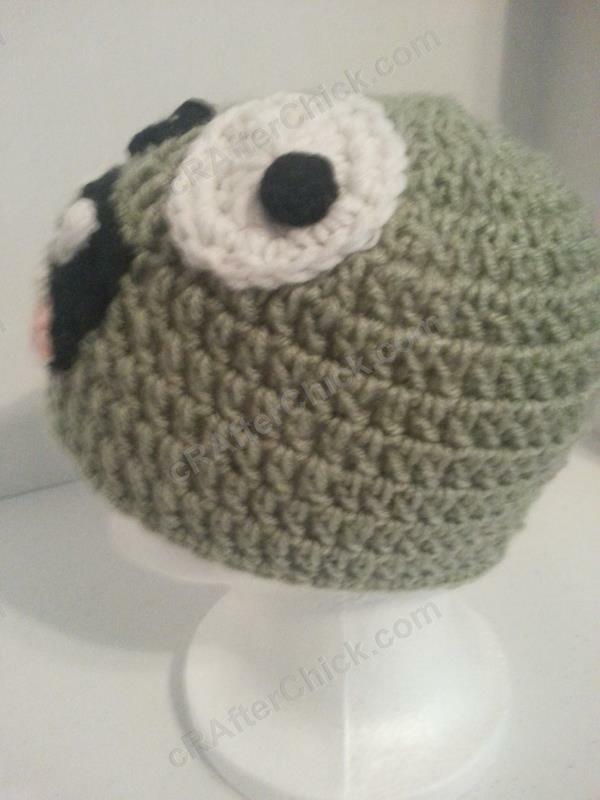 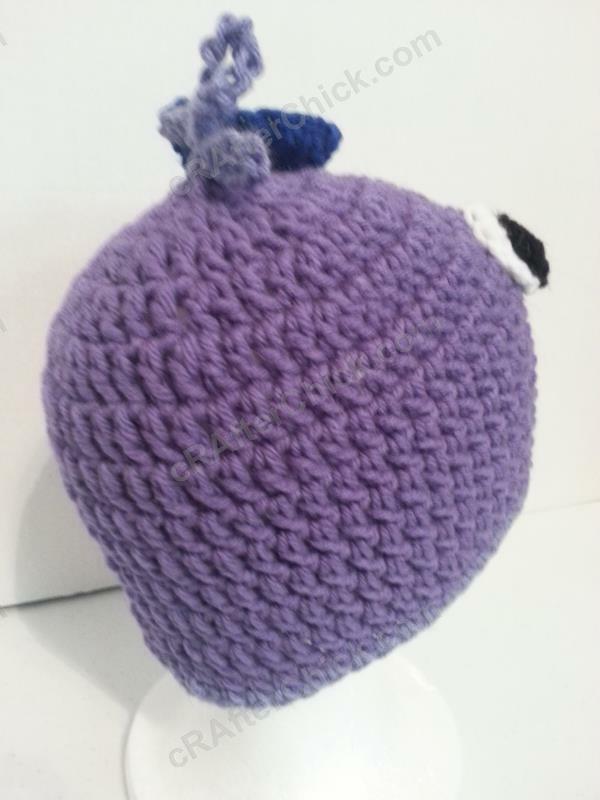 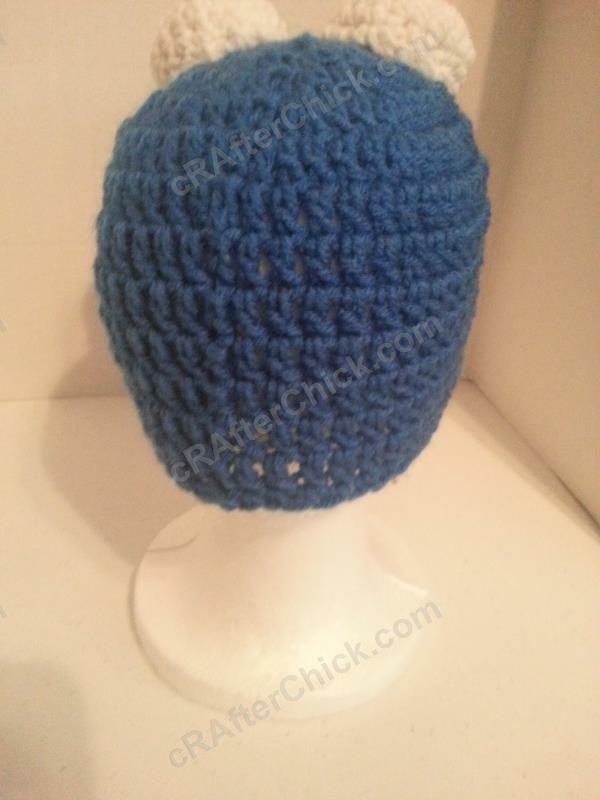 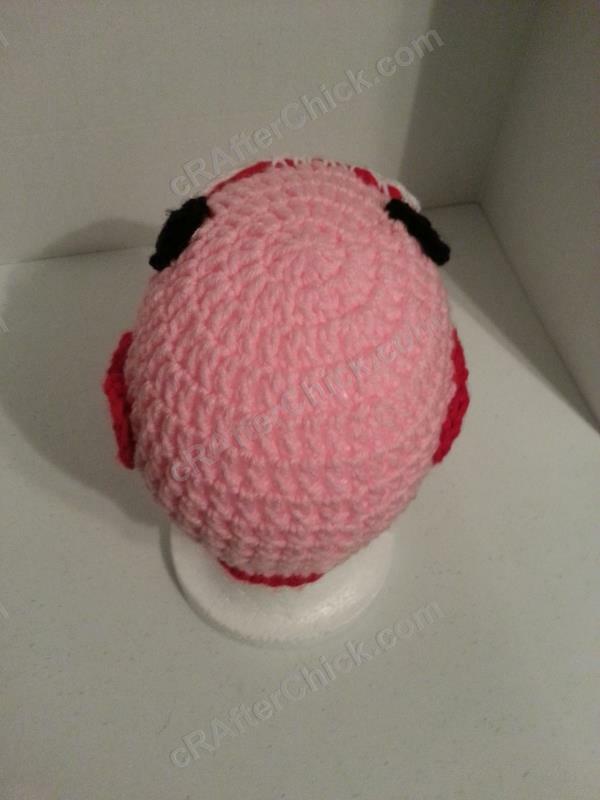 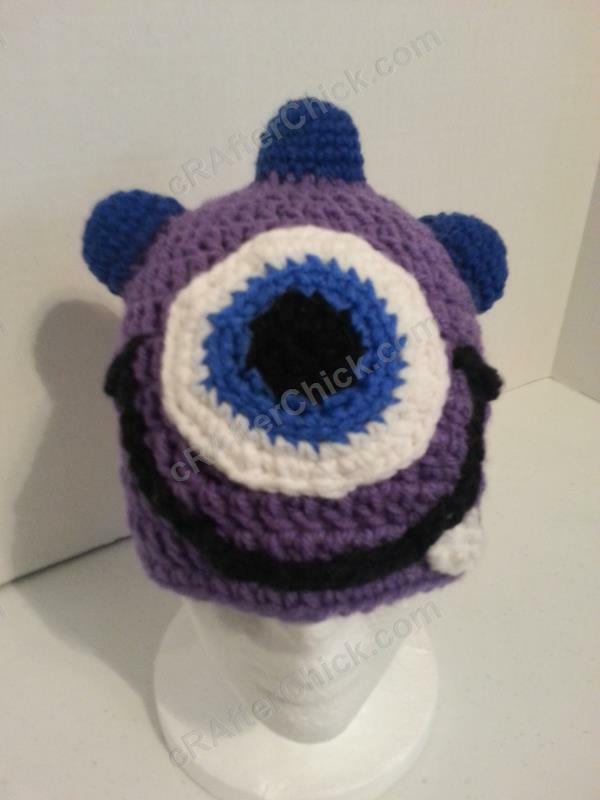 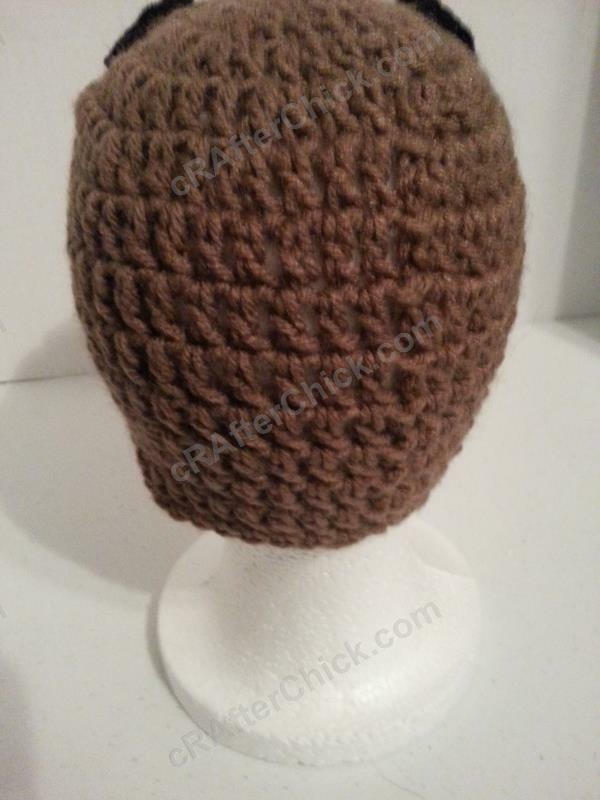 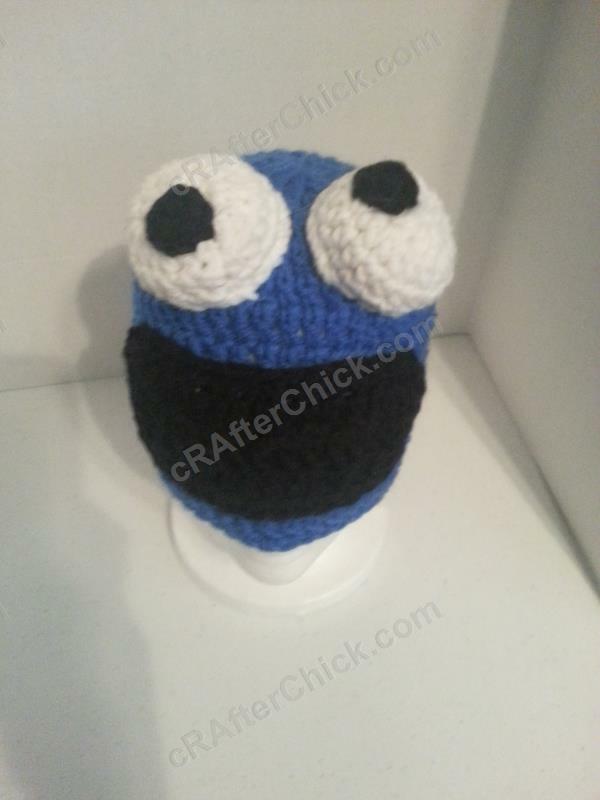 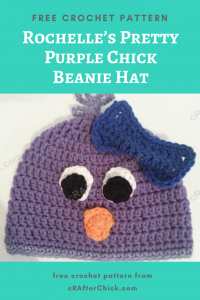 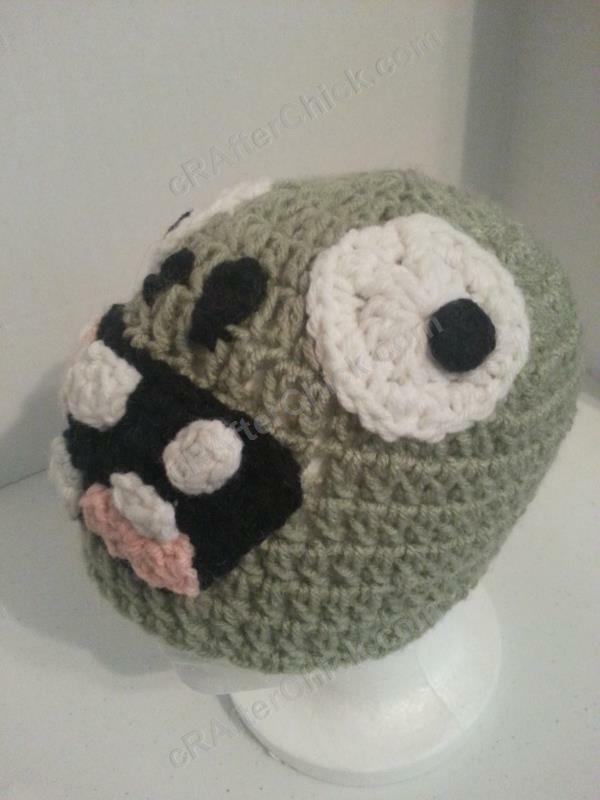 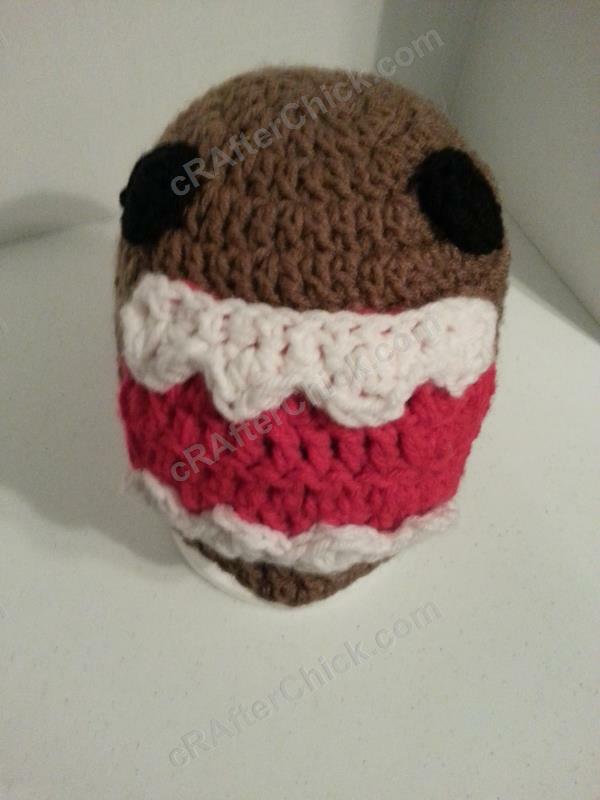 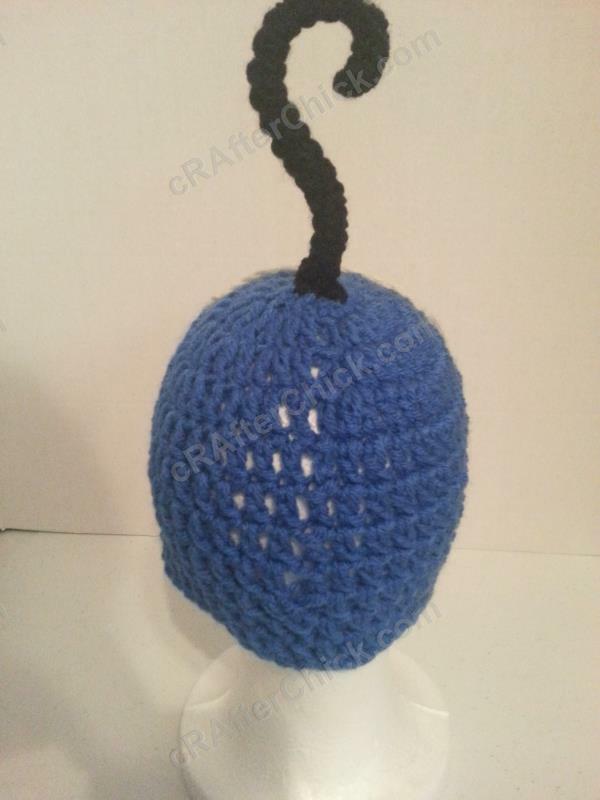 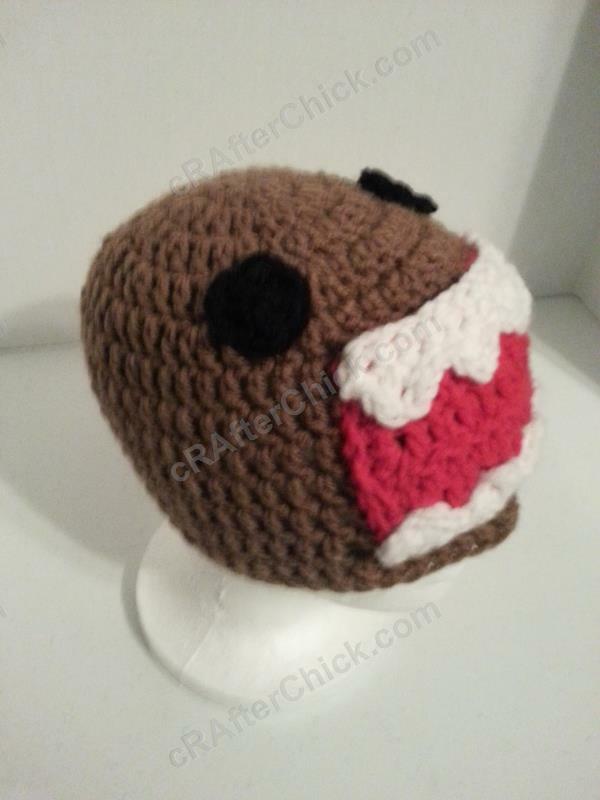 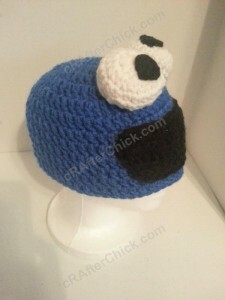 Once you have completed your beanie for the base you are ready to start on making your pretty purple chick hat. 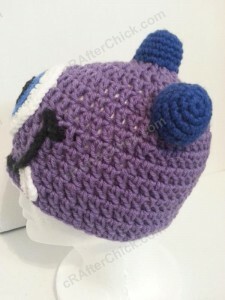 First we are going to add a simple lighter purple contrast trim to the beanie base. 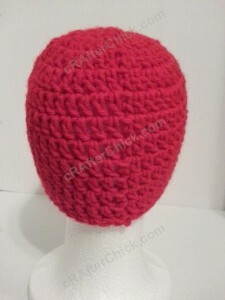 Taking your contrast color yarn, attach with a sl st where you left off at last round of your beanie. 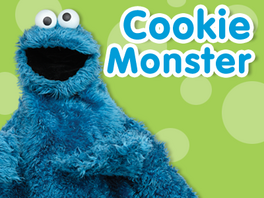 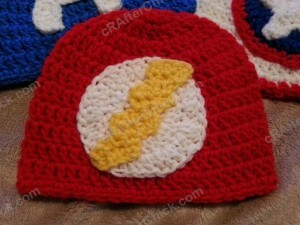 Ch 1 before placing 1 sc in 1st st and 1 sc in each st around. Sl st in top of 1st st in round and fasten off. 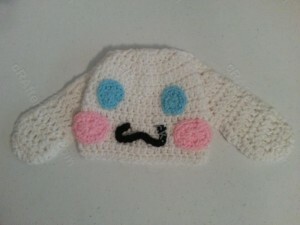 Ch 10, sl st in to last ch from hook. 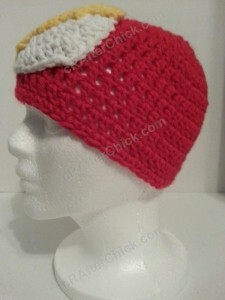 Ch 15, sl st back in to the ch you just worked ch from. 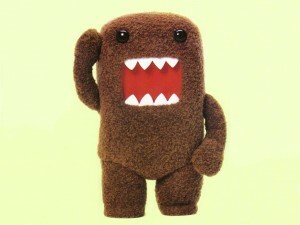 Ch 10 and sl st back into starting ch. Leave a long enough tail to secure your hair feathers on top of the beanie during assembly, before cutting yarn and pulling through. Now place this to the side until finishing steps. 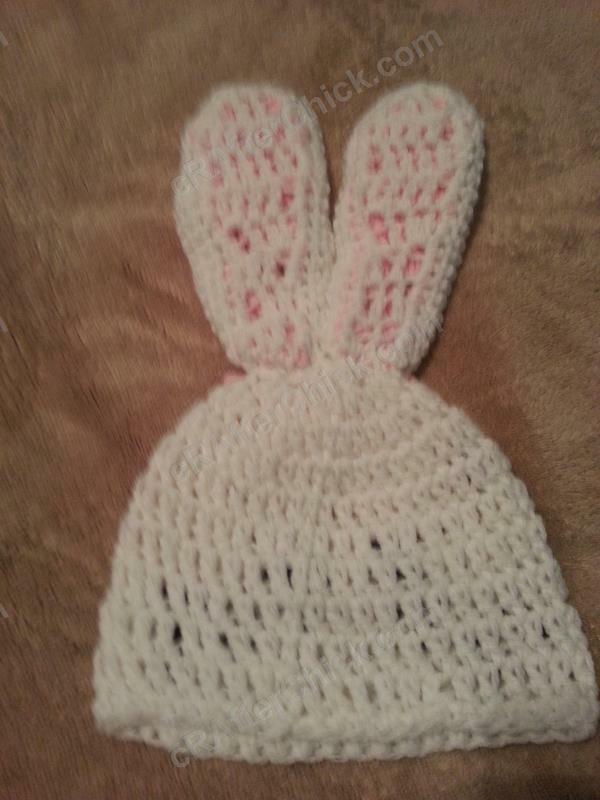 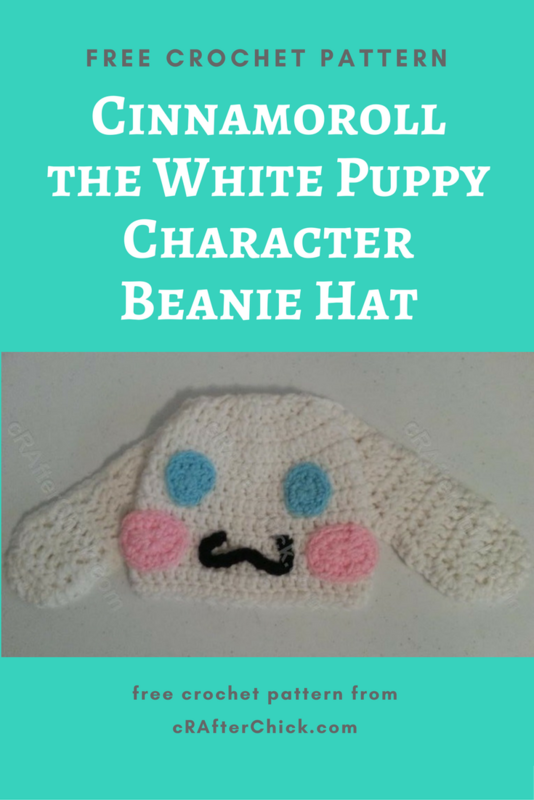 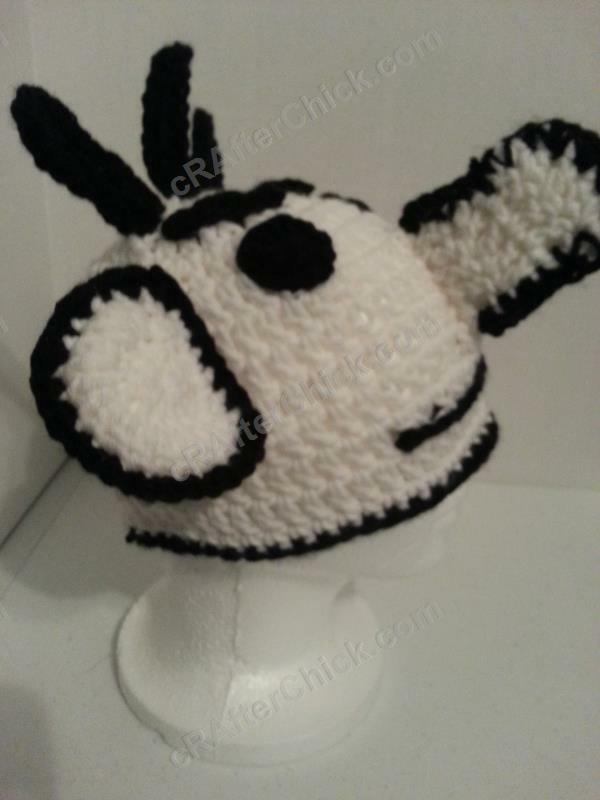 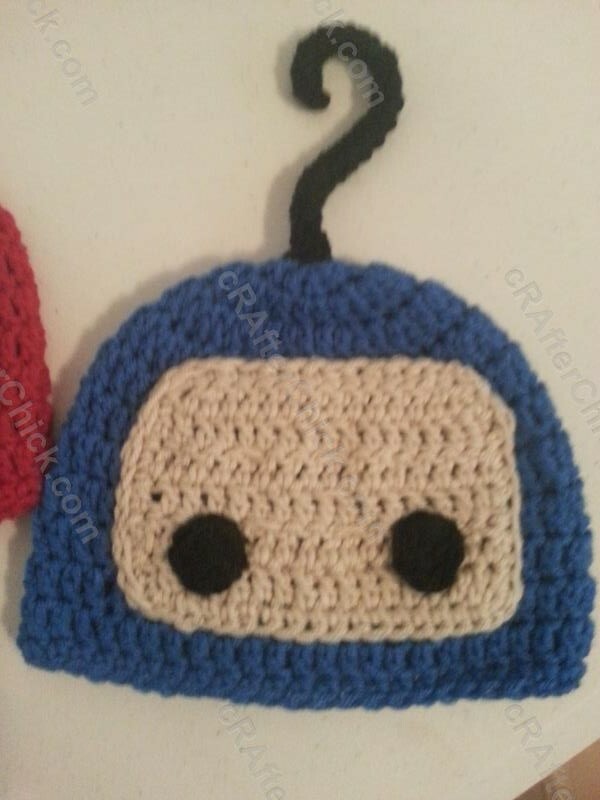 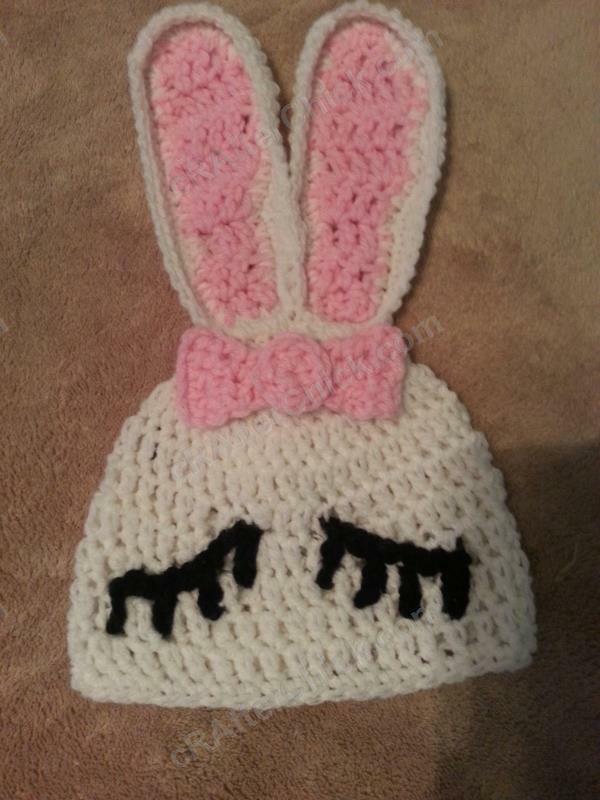 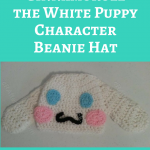 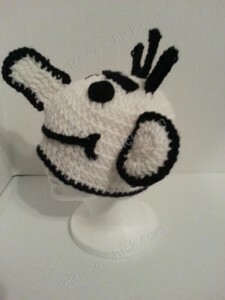 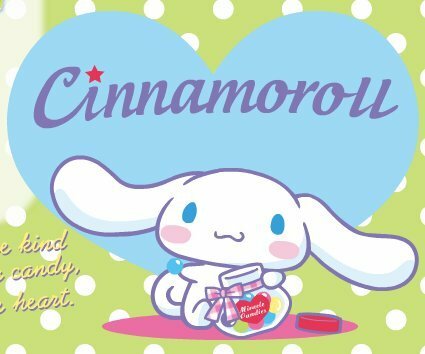 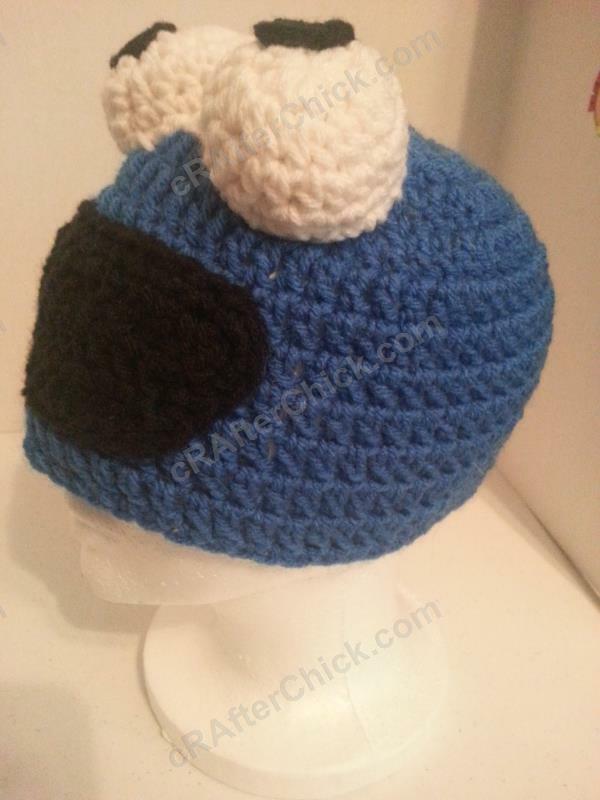 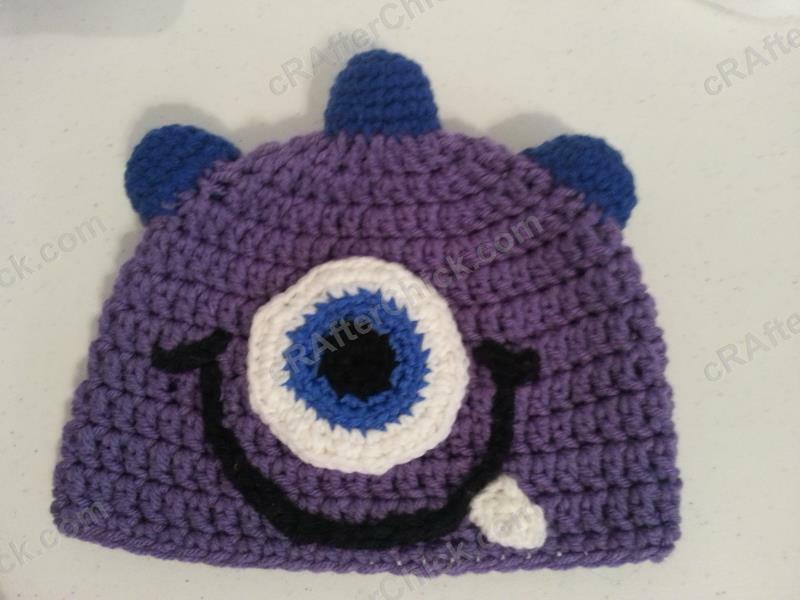 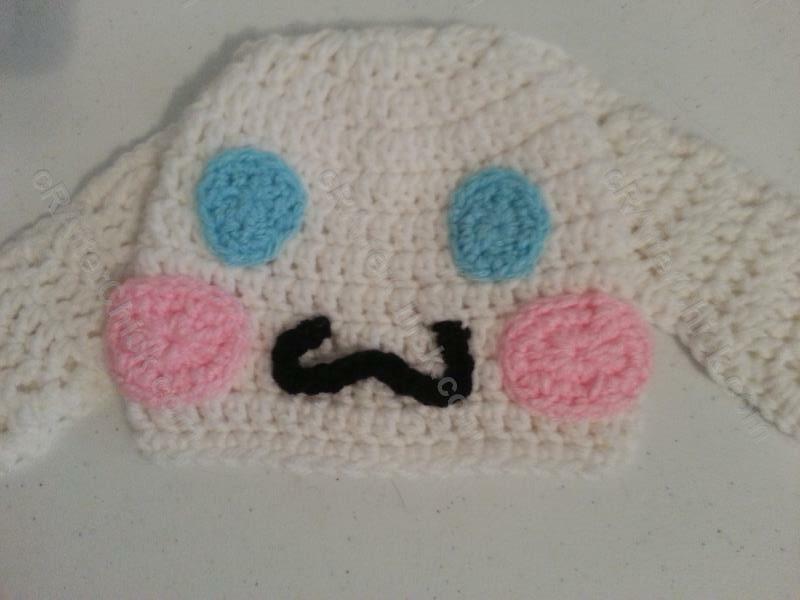 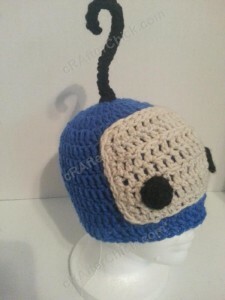 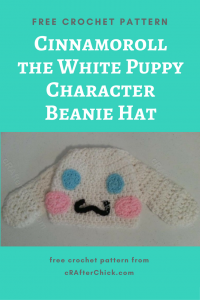 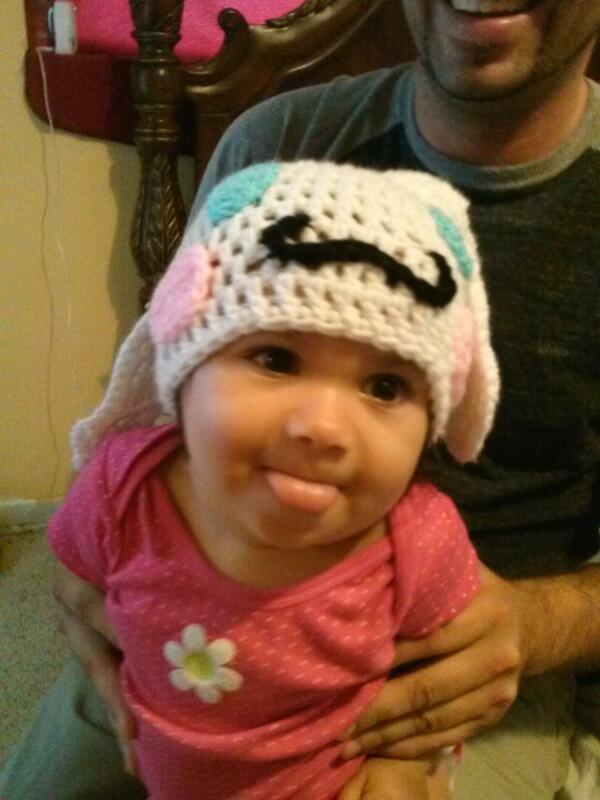 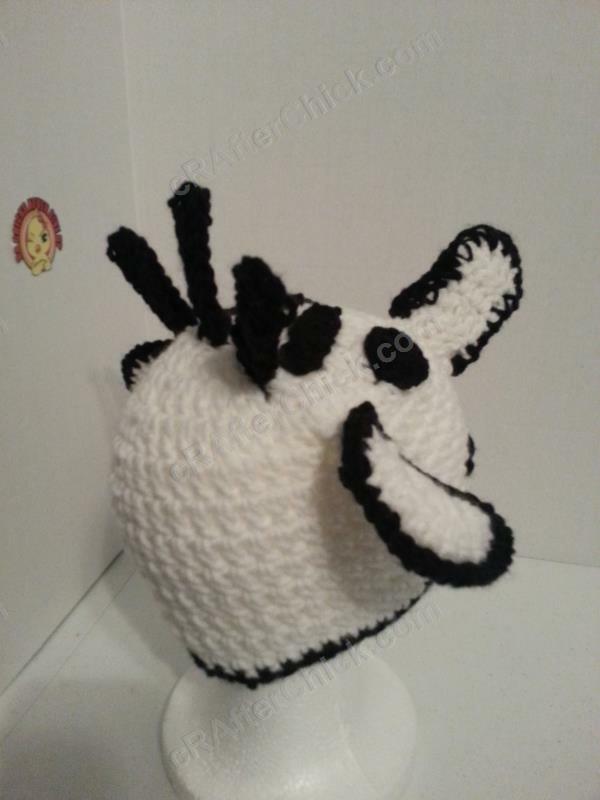 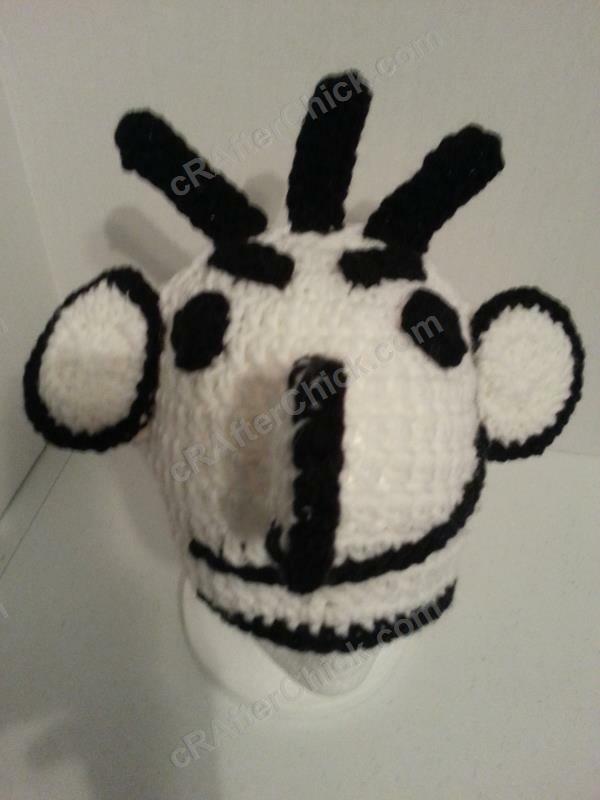 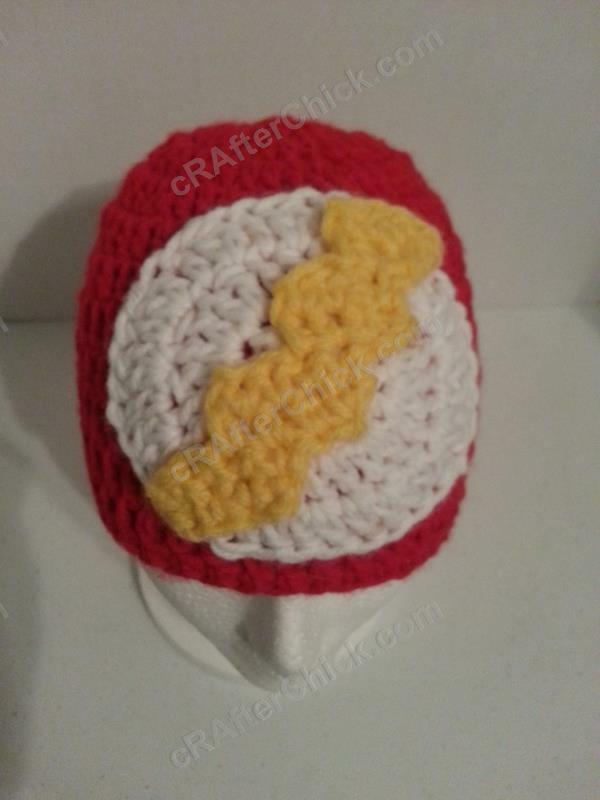 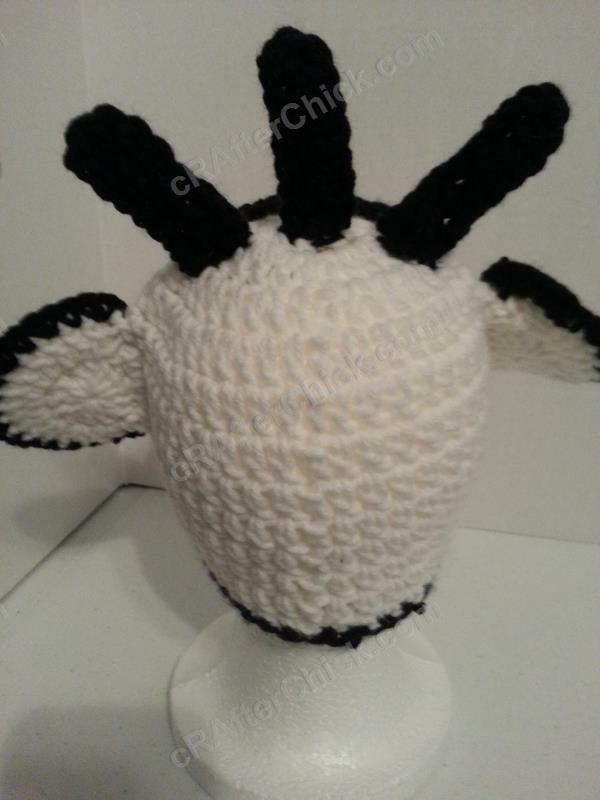 *This eye white design will work well on toddler to adult sized beanie hats. 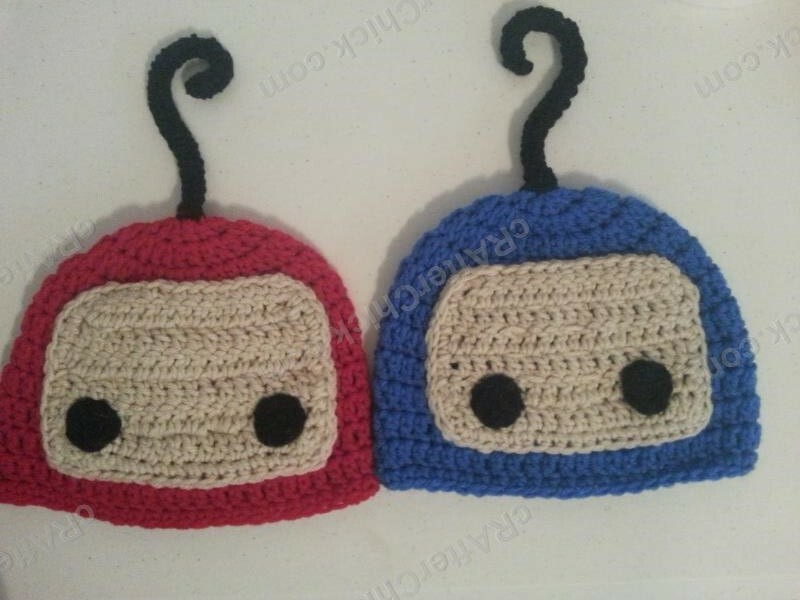 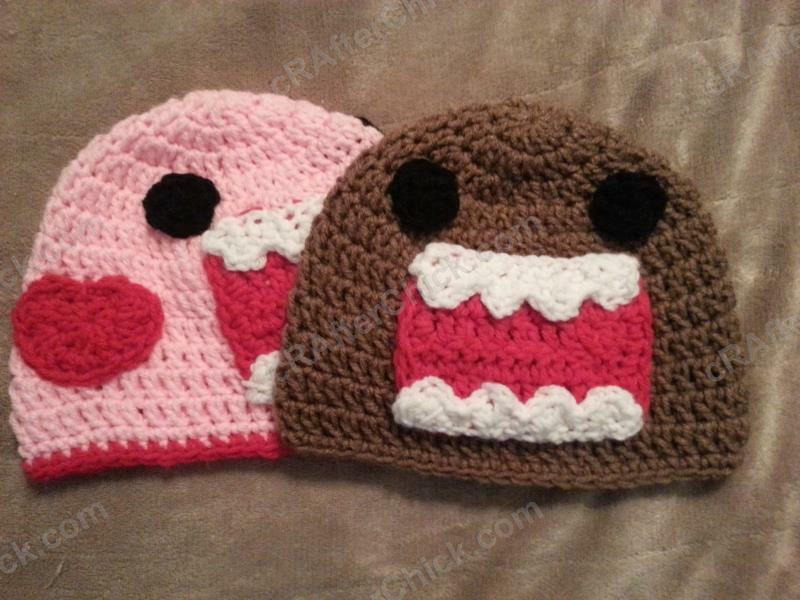 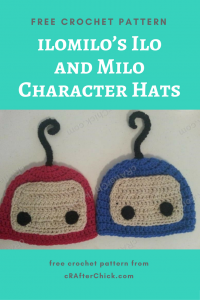 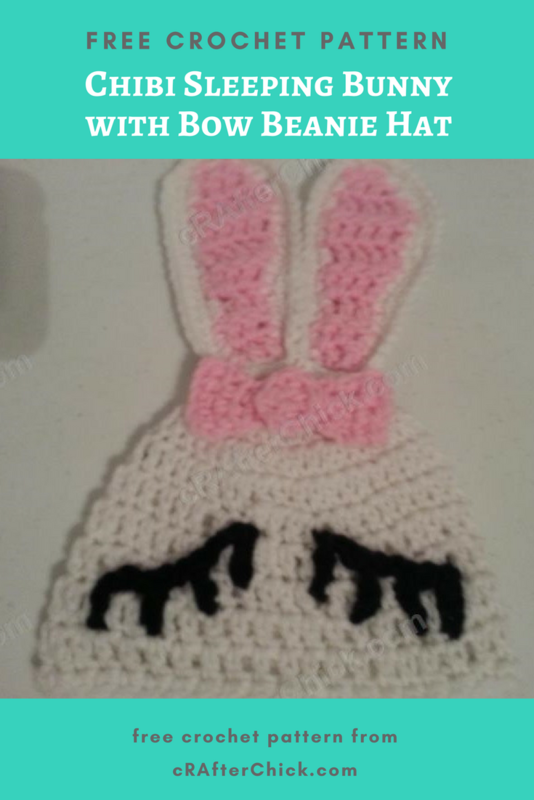 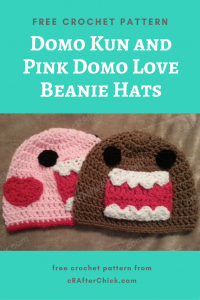 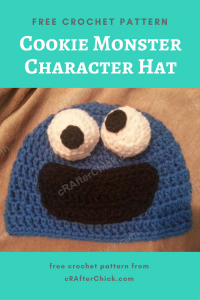 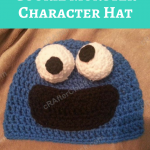 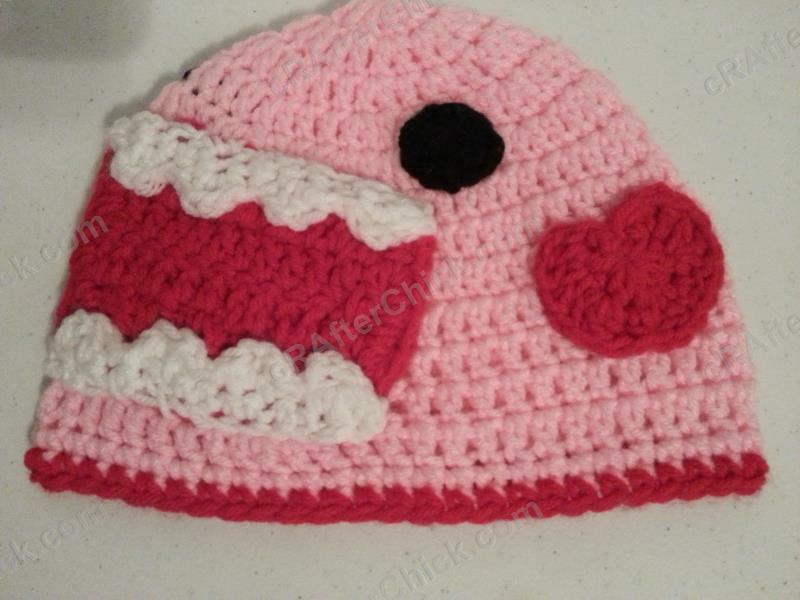 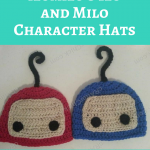 For newborn to 12 month sized hats, you will work 10 hdc instead of 12 dc in to your circle in Round 1. Make sure you leave a yarn tail long enough to be able to sew your beak in place on beanie before cutting yarn, pulling through and putting to side until needed in assembly stage. Round 2: Sl st in 2nd st, leaving 1st st unworked, ch 1 place 1 sc in next st, ch 1 before sl st in next st, stopping here and leaving rest of st unworked. Starting from the bottom up, use the tail left on the orange beak and your yarn needle to sew your Chick’s beak in place on beanie hat. 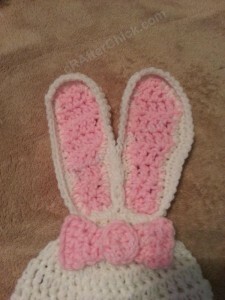 You can reference my pictures on how I placed mine. 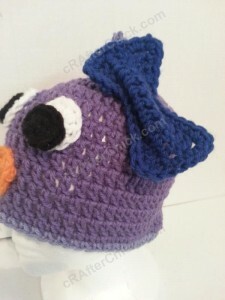 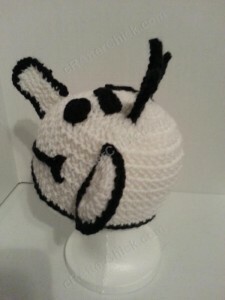 Once your beak is fully secured, pull your yarn to inside of hat before finishing off. 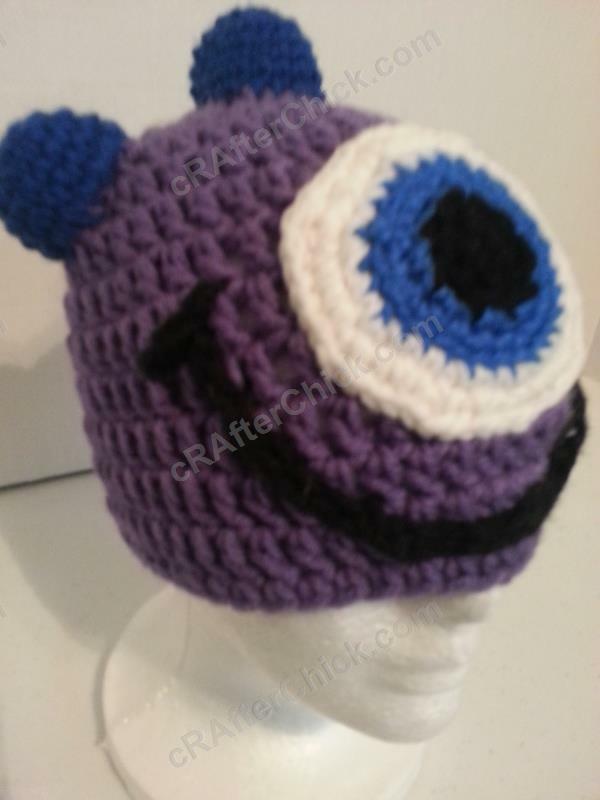 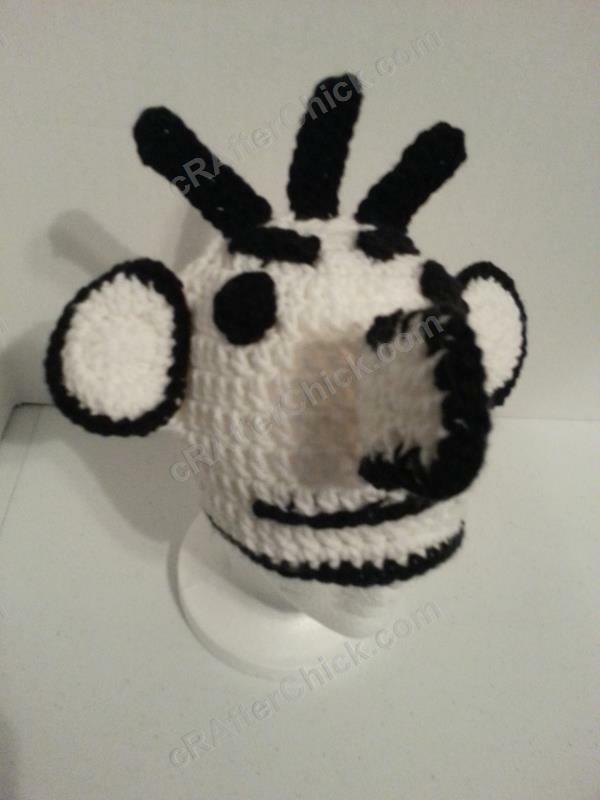 Using tail on one black eye pupil and needle, sew it in place securely on top of an eye white. Once secure, pull yarn to back of eye then fasten off. 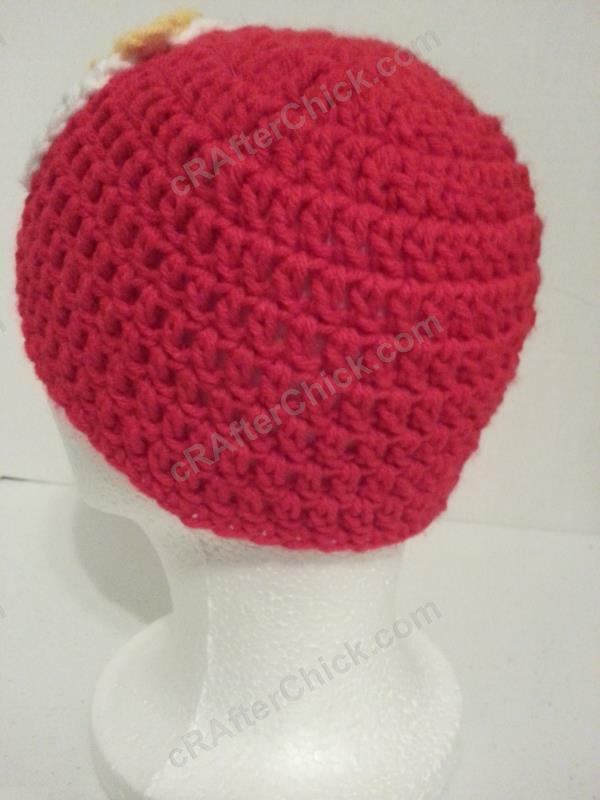 Repeat this process for second eye. 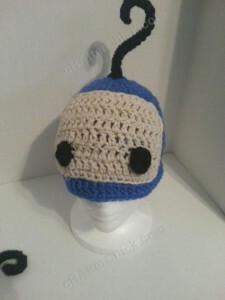 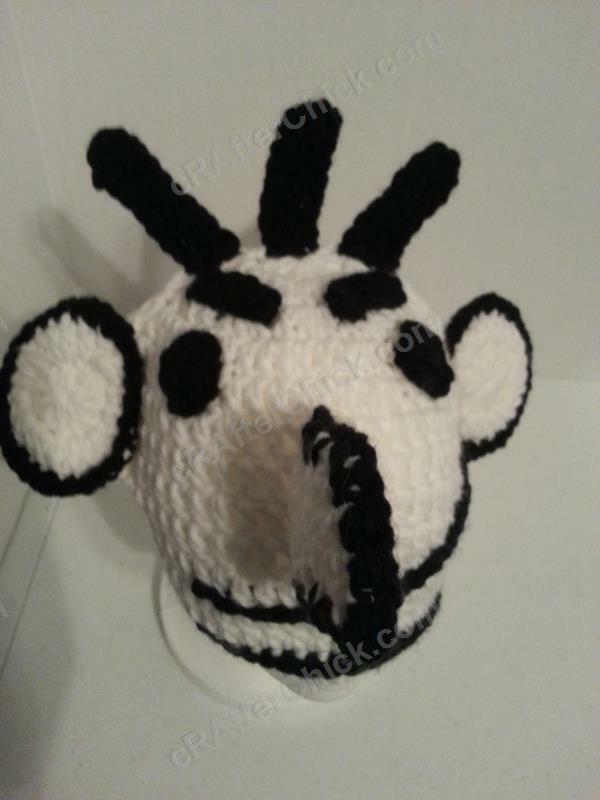 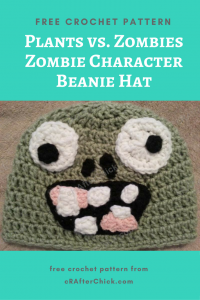 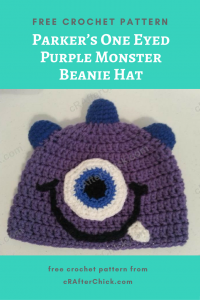 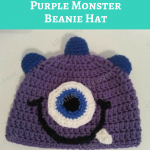 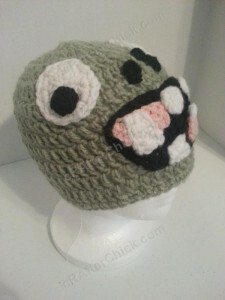 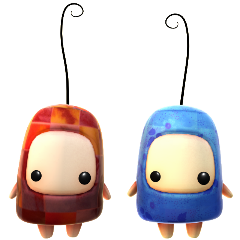 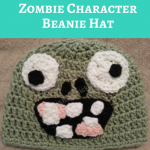 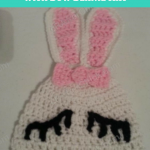 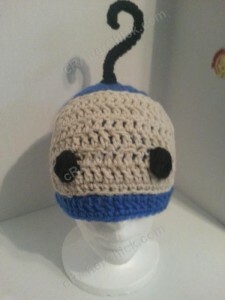 Now you want to use the tail from one assembled eye and your yarn needle to sew one eye in to the proper place on beanie. You can reference my pictures as to where I placed them on my hat. 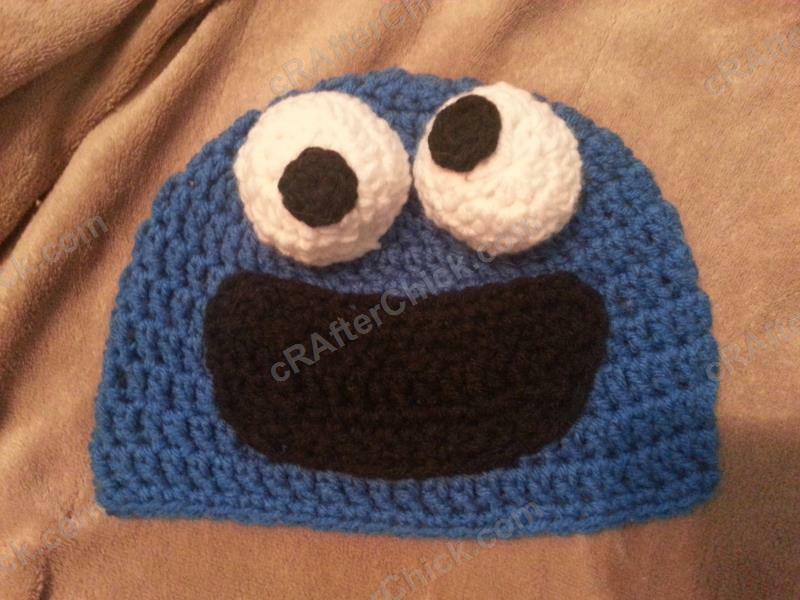 Once sewn on, pull yarn to inside of hat and finish off. Now go ahead and repeat this process for second eye. 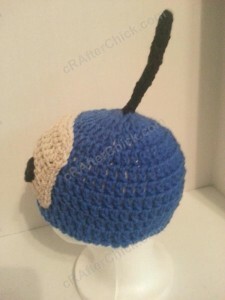 Next take the tail left on your blue hair bow for Chick hat and your yarn needle to sew in to your desired location on hat. Again you can reference my pictures on where I placed my own. 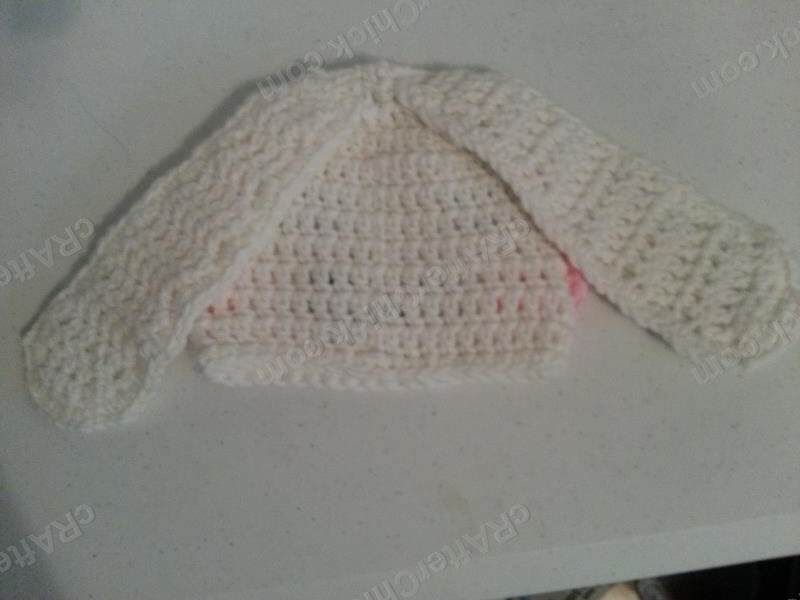 I like to fold the center of my bows in half and place a few back / forth stitches to help them retain that shape before sewing it on to my location. I like how the bows look when narrowed in the center but that is totally optional and up to your own preferences. Using tail left on your feathered “hair” you made earlier, secure it in to place on the top of your chick hat. I centered mine on the center of the original round on the beanie but feel free to play around with where you want to place yours. 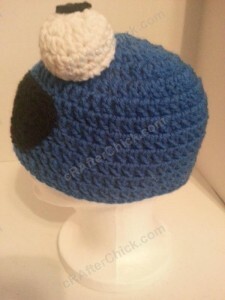 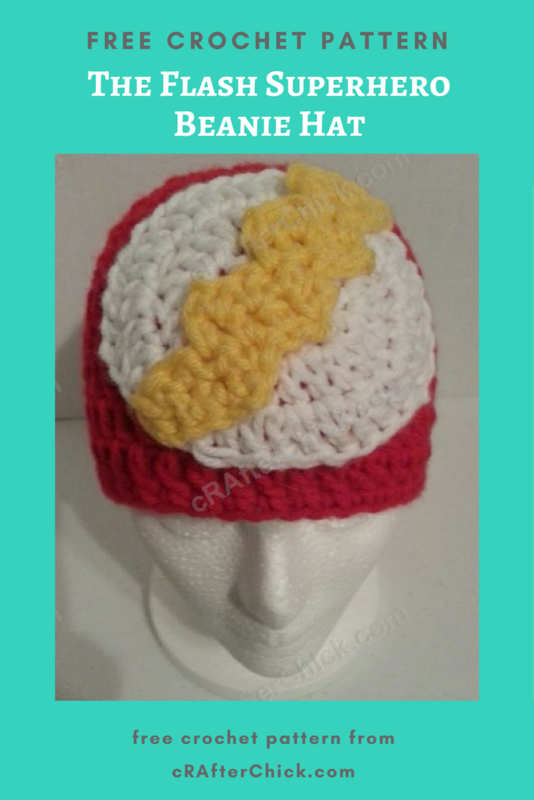 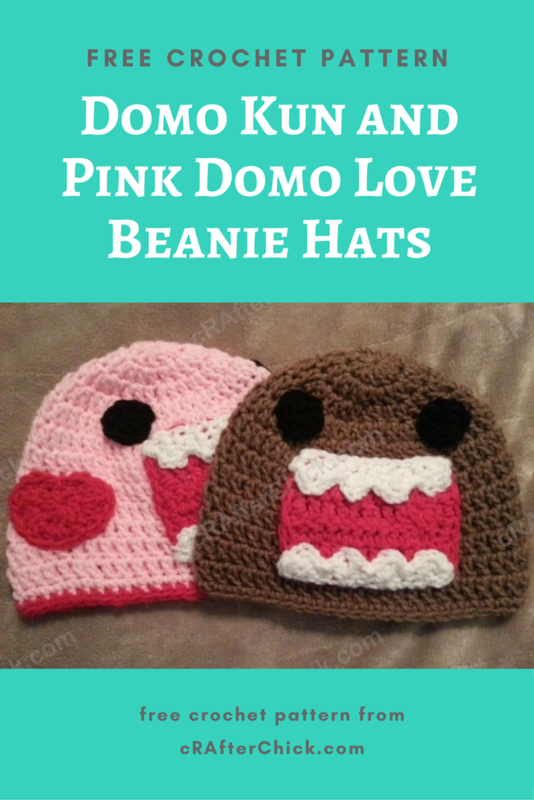 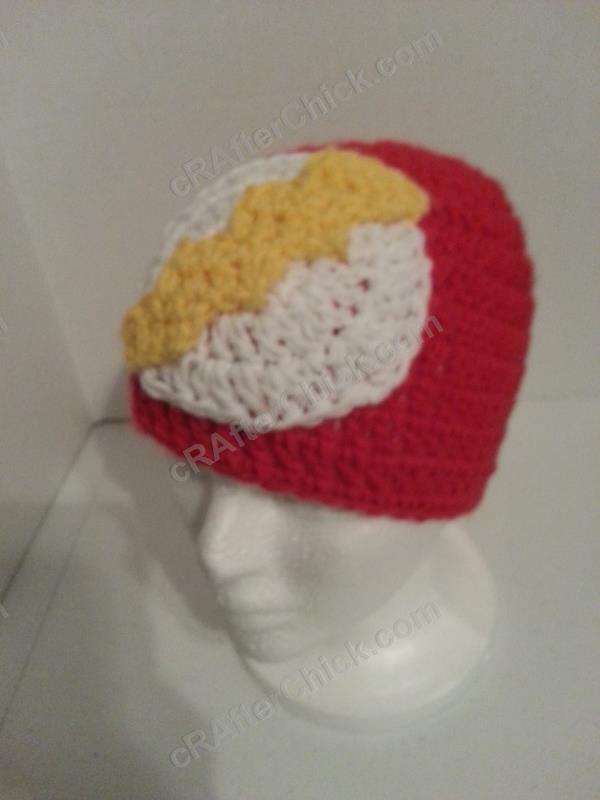 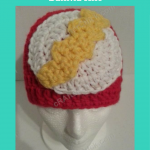 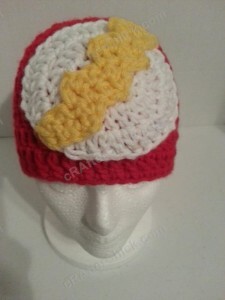 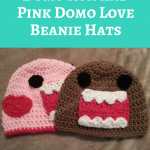 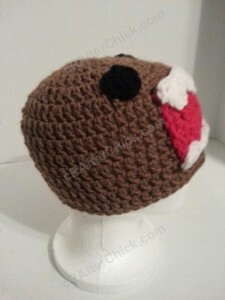 Once you have sewn it in place, pull yarn to inside of beanie and fasten off.